While there are store-bought options out there, we found that creating this edible “flower” arrangement with our kids was such a special time in the kitchen together, we wouldn’t dream of passing that up to just receive one in the mail…plus, our homemade version is way more cost-effective; win-win! If you can get your hands on some floral, garden-ish cookie cutters (we’re thinking flowers, butterflies, throw some hearts in there for good measure, etc.) and a bunch of fruit, you are good to go. A halved watermelon serves as your base, then you can basically go crazy with any other fruits you like, stamping out shapes with the cookie cutters and making a bunch of fruit skewers to be propped in your melon base. Got a melon baller on hand? Perfect. Start carving up the remaining watermelon half or cantaloupe and top your skewers with the melon balls. This is a fun, family activity (a great way to show Mom or Dad you care! ), presents beautifully, and can serve a crowd. Need we say more? Get going and make your own edible arrangement – we know you’ll love it! Cut off the top 1/2 inch of watermelon, then cut watermelon in half. Flip melon over so it’s sitting on flat base. This will be the bottom of your arrangement. Leaving base of watermelon intact, use a melon baller to scoop out other half of melon to use on fruit skewers. Take second watermelon and cut it into 1-inch rounds. Use desired cookie cutters to stamp out watermelon pieces. Cut cantaloupe in half (scooping out center) and use melon baller to scoop out cantaloupe balls. Cut off top and bottom of pineapple, then cut off outer peel. Cut into 1-inch rounds, then use cookie cutters to stamp out designs. 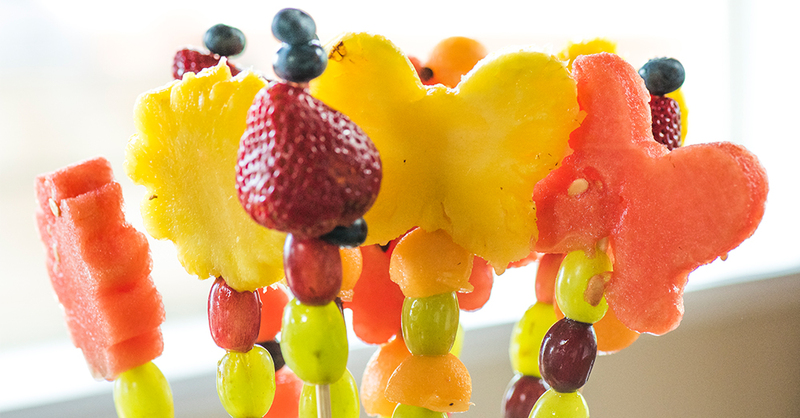 Line skewers with grapes, then top with strawberries, cantaloupe, watermelon, pineapple, or blueberries. Take skewers and place them in watermelon base, arranging them as desired. Refrigerate or serve immediately. Enjoy!